recommended for: Fans of Diana Wynne Jones (Howl's Moving Castle), Poison by Bridget Zinn, Divergent by Veronica Roth, or good original fantasy hybrids. I was in love with this book from the dedication page: "To Diana Wynne Jones." Who happens to be one of my favorite authors of all time. (Check my review for Howl's Moving Castle and how I mention her 50,000 times every post.) Then I started reading and got a little bored with it. Not bored, so much, but frustrated. It's wordy and that took me a while to get into. Once I did get into it, I couldn't get back out. It's a whimsical mix of pure fantasy and a shot of dystopian sci-fi, which works splendidly to create something very unique. The worldbuilding is worthy of Diana. From the first page, with the strange lingo and shadowy backstory, you feel like you're there. There's mystery, a little romance, and a fun assortment of magical creatures never-before-seen. Add some mangy dogs and origami and you have an unforgettable magical adventure. McKinley draws you in masterfully by not telling you a lot up front. She throws around words like "cobey" and "Oldworld" and "silverbug". Instead of fully explaining, she lets you find out as you go along. This makes for an instant mystery in addition to the bigger mystery: what are all those dreeping shadows around stepfather Val? It takes a little setup, but you're quickly thrust into an intrigue of magical creatures, secret wizards hiding from the government gene-choppers, and rifts in space and time that threaten the world as they know it. Speed up to Maggie battling a world rift with origami and you're incapable of putting it down. That's how I felt. There were plenty of twists and turns, adventure, mysteries, puzzles, and a sweet romance that didn't make me want to hurl. Every time you turn the corner, something new is happening. It all leads up to a crazy, satisfying ending. Did I mention high fantasy / sci-fi / dystopian? Seriously. It works. Here's a world where rifts abound, changing landscapes and messing with how things work. Half the world uses its magic to combat these rifts. Then there's Newworld, where people became convince that magic was the problem. So a company called GeneCor helped them stomp out magic by deleting the "magic gene" in every new child. Only, guess what? It didn't totally work. Tell me that's not a compelling set-up and I will smite you. Maggie was a hard sell at first, but only because of how much she talked. That was my main problem when I started the book, honestly. She rambles about everything. Fine, whatever, character trait. Cool. Only McKinley goes overboard showing that (see below). Otherwise, I loved her. She's spunky, fierce, a little annoying, but in a way where you really root to see her change. Her best friend, Jill, doesn't get enough screen time but is a strong supporting role. I think my main issue was Casimir. He pops in and you expect him to be a big huge deal, and then he's AWOL for like 50 pages. I wasn't sure if his character needed to be a separate person. That said, Val is great and so sweetly tragic, Takahiro is swoonworthy in a nerdy kind of way, and Maggie's mom really comes to surprise you. What I liked to was that there wasn't one cackling ubervillain. It was the motley adventurers against a faceless government, an idea, and that made it work for me. I almost thought I wouldn't like this book. Because, as I mentioned, Maggie rambles (and uses parentheticals every five seconds, you know, like this, only way more often). It's like the Spoon Scene in Twilight. You know. Bella eats cereal. Meyer describes Bella meticulously washing bowl. Here, we get a lot of excessive info on dog training, school, pretty much everything Maggie does. Cut out half of it and you'd get the idea of her character without wanting to strangle her. That said, I got over it by the end because the rest of the book was so great, I forgave it this flaw. On the good side, McKinley has a way with making you feel part of the world. She inserts cool slang like "dreeping" and "dead battery" right away without explaining, so you get a feel for the world. She also has Diana's touch of giving a book atmosphere. 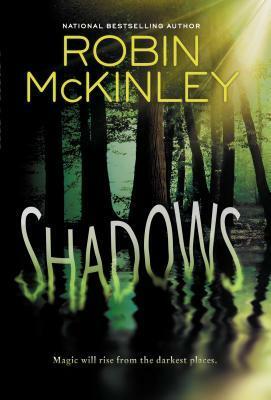 There's something immediately whimsical and magical and squee-worthy about the world in Shadows. Compare it to Labyrinth (the movie) or Harry Potter. Cut out about 50 pages and it'd be perfect. A whimsical magical adventure that crosses genre boundaries for something explosive and new. Oh wow, lucky you to have had the chance to read this already! I'm looking forward to it lots. I won't lie, I feel incredibly lucky. I can't wait for you to read it! It was really a fantastically fun book. "Fans of Diana Wynne Jones (Howl's Moving Castle), Poison by Bridget Zinn, Divergent by Veronica Roth, or good original fantasy hybrids." Woot, woot! I haven't read the first two, but the last two, I am definitely a fan of. Yesss to a great start! High fantasy, sci-fi, and dystopian? Love. I love genre benders like that. It's a little sad that it takes a while to get *into* the book, but good that after that it's smooth sailing. I've heard a lot about McKinley's writing - he's compared to Cashore and Turner a lot, I think. Perhaps the atmosphere and well developed world. I could totally get over a rambling main character, ha, since I may be in danger of doing that right now! Oh god, you MUST read Howl's Moving Castle. Most amazing book! McKinley does a great job of blending the genres without making it seem like some weird fruit salad. I haven't read Cashore yet, so once I do, we'll see if I agree. Haha, maybe the rambling will not bug you then. I definitely got over it towards the end. Hey, y'all know that Robin McKinley is a woman, right?